Though not formally dedicated to Queen Elizabeth, the Bishops' Bible includes a portrait of the queen on its title page. The 1569 quarto edition shows Elizabeth accompanied by female personifications of Justice, Mercy, Fortitude, and Prudence. The Bishops' Bible is an English translation of the Bible which was produced under the authority of the established Church of England in 1568. It was substantially revised in 1572, and the 1602 edition was prescribed as the base text for the King James Bible that was completed in 1611. The Bishop's Bible succeeded the Great Bible of 1539, the first authorized bible in English, and the Geneva Bible of 1557-1560. The thorough Calvinism of the Geneva Bible (more evident in the marginal notes than in the translation itself) offended the high-church party of the Church of England, to which almost all of its bishops subscribed. They associated Calvinism with Presbyterianism, which sought to replace government of the church by bishops (Episcopalian) with government by lay elders. However, they were aware that the Great Bible of 1539 — which was the only version then legally authorized for use in Anglican worship — was severely deficient, in that much of the Old Testament and Apocrypha was translated from the Latin Vulgate, rather than from the original Hebrew, Aramaic and Greek. In an attempt to replace the objectionable Geneva translation, they circulated one of their own, which became known as the "Bishops' Bible". The promoter of the exercise, and the leading figure in translating was Matthew Parker, Archbishop of Canterbury. It was at his instigation that the various sections translated by Parker and his fellow bishops were followed by their initials in the early editions. For instance, at the end of the book of Deuteronomy, we find the initials "W.E. 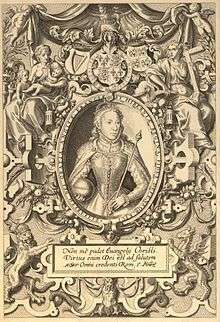 ", which, according to a letter Parker wrote to Sir William Cecil, stand for William Alley, Bishop of Exeter. Parker tells Cecil that this system was "to make [the translators] more diligent, as answerable for their doings." Unhappily, Parker failed to commission anyone to act as supervisory editor for the work completed by the various translators, and was too busy to do so himself, and accordingly translation practice varies greatly from book to book. Hence, in most of the Old Testament (as is standard in English Versions) the tetragrammaton YHWH is represented by "the LORD", and the Hebrew "Elohim" is represented by "God". But in the Psalms the practice is the opposite way around. The books that Parker himself worked on are fairly sparingly edited from the text of the Great Bible, while those undertaken by Grindal of London emerged much closer to the Geneva text. The bishops deputed to revise the Apocrypha appear to have delivered very little, as the text in these books reproduce that of the Great Bible broadly the same. As the Apocrypha of the Great Bible was translated from the Latin Vulgate, the Bishops' Bible cannot strictly claim to have been entirely translated from the original tongues. The Bishops' Bible was first published in 1568, but was then re-issued in an extensively revised form in 1572. In the revision a number of switches were made to the New Testament in the direction of more "ecclesiastical" language (e.g. introducing the term "charity" into I Corinthians 13), but otherwise to bring the text more into line with that found in the Geneva Bible; and in the Old Testament, the Psalms from the Great Bible were printed alongside those in the new translation, which had proved impossible to sing. From 1577 the new psalm translation was dropped altogether; while further incremental changes were made to the text of the New Testament in subsequent editions. The Bible had the authority of the royal warrant, and was the second version appointed to be read aloud in church services (cf. Great Bible, King James Bible). It failed to displace the Geneva Bible as a domestic Bible to be read at home, but that was not its intended purpose. The intention was for it to be used in church as what would today be termed a "pulpit Bible". The version was more grandiloquent than the Geneva Bible. The first edition was exceptionally large and included 124 full-page illustrations. The second and subsequent editions were rather smaller, around the same size as the first printing of the King James Bible, and mostly lacked illustrations other than frontispieces and maps. The text lacked most of the notes and cross-references in the Geneva Bible, which contained much controversial theology, but which were helpful to people among whom the Bible was just beginning to circulate in the vernacular. The last edition of the complete Bible was issued in 1602, but the New Testament was reissued until at least 1617. William Fulke published several parallel editions up to 1633, with the New Testament of the Bishops' Bible alongside the Rheims New Testament, specifically to controvert the latter's polemical annotations. The Bishops' Bible or its New Testament went through over 50 editions, whereas the Geneva Bible was reprinted more than 150 times. The translators of the King James Bible were instructed to take the 1602 edition of the Bishops' Bible as their basis, although several other existing translations were taken into account. 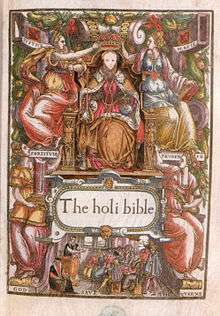 After it was published in 1611, the King James Bible soon took the Bishops' Bible's place as the de facto standard of the Church of England. Later judgments of the Bishops' Bible have not been favorable; David Daniell, in his important edition of William Tyndale's New Testament, states that the Bishops' Bible "was, and is, not loved. Where it reprints Geneva it is acceptable, but most of the original work is incompetent, both in its scholarship and its verbosity". Jack P. Lewis, in his book The Day after Domesday: The Making of the Bishops' Bible, notes that unsympathetic reviews of this Bible have been done. However, "Granting all the shortcomings eighteenth to twenty-first-century scholarship can find in the Bishops' Bible, it was an important stage in moving English people from prohibited Bible reading to being a Bible-reading people. The revisers labored to give God's book to God's people in a language they could understand. The King James translators did not think they were making a bad translation into a good one, but were making a good one better." Unlike Tyndale's translations and the Geneva Bible, the Bishops' Bible has rarely been reprinted. The most available reprinting of its New Testament portion (minus its marginal notes) can be found in the fourth column of the New Testament Octapla edited by Luther Weigle, chairman of the translation committee that produced the Revised Standard Version. The Bishops' Bible is also known as the "Treacle Bible", because of its translation of Jeremiah 8:22 which reads "Is there not treacle at Gilead? ", a rendering also found in several earlier versions as well such as the Great Bible. In the Authorized Version of 1611, "treacle" was changed to "balm". ↑ Pollard, Alfred W. (2003). The Holy Bible: 1611 Edition, King James Version. Peabody, MA: Hendrickson. pp. 22–3. ISBN 1-56563-160-9. 1 2 3 4 Herbert, A. S. (1968). Historical Catalogue of Printed Editions of the English Bible 1525–1961. New York: American Bible Society. pp. 125–480. ISBN 978-0-564-00130-9. ↑ Daniell, David (1989). Tyndale's New Testament. New Haven: Yale. ISBN 0-300-04419-4. ↑ Lewis, Jack P. (2016). The Day after Domesday: The Making of the Bishops' Bible. Eugene: Wipf & Stock. p. 137. ISBN 978-1-4982-3343-9. ↑ Weigle, Luther A. (1962). The New Testament Octapla: Eight English Versions of the New Testament in the Tyndale-King James Tradition. NY: Thomas Nelson. ↑ Great Bible, Jeremiah ch. 8 Archived June 26, 2015, at the Wayback Machine. The Holie Bible: conteynyng the Olde Testament and the Newe, scan of the first edition (1568) at the Internet Archive. Studylight Version of the Bishops Bible Text. ;From Studylight, An incomplete Version, lacking in the Apocrypha, which existed in the original, but in the original spelling. Bishops Bible on StudyBible.info — Includes the Apocrypha.